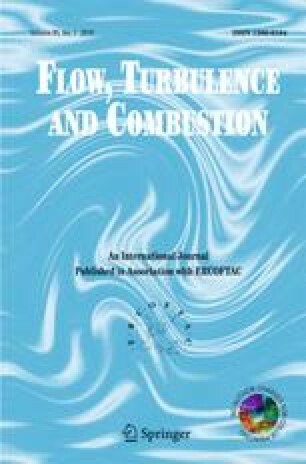 Turbulent opposed jet burners are an excellent test case for combustion research and model development due to the burners’ compactness, relative simplicity, and the good optical access they provide. The flow-field in the flame region depends strongly on the turbulence generation inside the nozzles, so that realistic flow simulations can only be achieved if the flow inside the nozzles is represented correctly, which must be verified by comparison to suitable experimental data. This paper presents detailed particle image velocimetry (PIV) measurements of the flow issuing from the turbulence generating plates (TGP) inside a glass nozzle. The resulting data is analyzed in terms of first and second moments, time-series, frequency spectra and phase averages. The measurements show how individual high velocity jets emerging from the TGP interact and recirculation zones are formed behind the solid parts of the TGP. Vortex shedding is observed in the jet’s shear layer were high levels of turbulent kinetic energy are generated. Time series measurements revealed periodic pulsations of the individual jets and implied a coupling between adjacent jets. The peak frequencies were found to be a function of the Reynolds-number. Electronic supplementary material The online version of this article (doi: 10.1007/s10494-010-9257-4) contains supplementary material, which is available to authorized users.